Taliesin Apprenticeship was the most important experience of my life. I was nineteen in September of 1959 when my father dropped me off at Tanyderi and drove off down the hill. The room assigned to me was on the top floor with an eastern view toward Taliesin in the distance. Each morning at sunrise I would awake and look over toward the sun rising over Taliesin. I was in paradise. 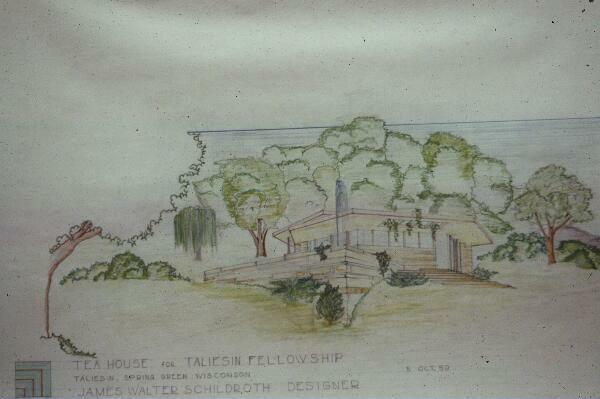 I had come to Taliesin with one intention, to see if in my own mind I could be an architect. 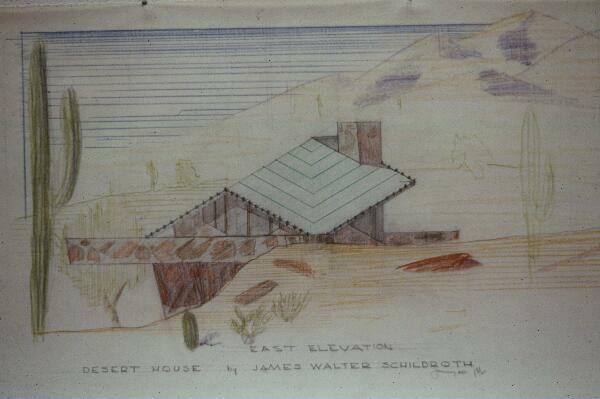 I wanted to design buildings the way Frank Lloyd Wright designed his architecture. I had decided I would stay at Taliesin until I learned how to do this. Tanyderi My room was in the upper left. This is the view I had each morning east to Taliesin. I was assigned my own drafting table in the great drafting room at Taliesin in Wisconsin. My first project was to design a small structure for the use of the fellowship members as a place to have afternoon tea. 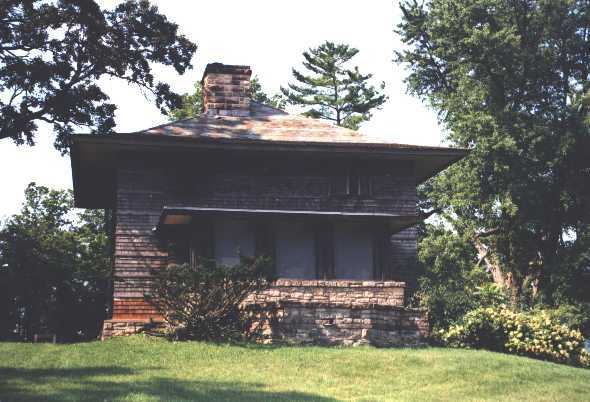 Several apprentices worked on their design for this tea house, under the guidance of Jack Howe. 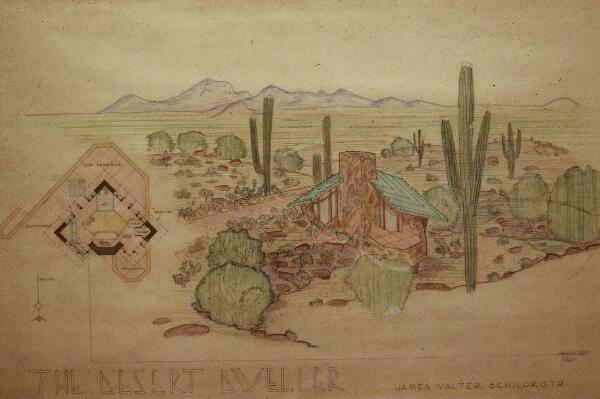 I soon had a design plan and section design influenced by the style of the buildings at Taliesin. Then I plotted a perspective using the two point construction method and made my first color pencil rendering. It was not bad for my first design but as I looked around at the other designs I realized that I had a long way to go. How did the others come up with their form and idea? How did they get the idea? I had a copy of the book, "A Testament", by Mr. Wright, given to me by my mother a few years before. I had read every word and memorized every photo and drawing. The secret to original design was in that book but I did not understand it yet. I continued to design other projects, one after the other. I was not assigned to work in the drafting room during the regular work day until over a year later; however, I did have my drafting board in the Great Draughting Space and used all my spare time to work on my designs. I turned out about one a month while I was an apprentice, which amounted to over two dozen designs, mostly houses. Designing was what I lived for and why I was at Taliesin. In May of 1960 there was a very important book published and I had a copy in my hands and was reading it that summer. The book, "Frank Lloyd Wright: Writings and Buildings", selected by Edgar Kaufmann and Ben Raeburn. This book had the secret of creative ideas in Mr. Wrights own words. There on page 221 in my copy was and is the secret, under the heading "The Concept and the Plan", and I include the complete text here as follows. In the logic of the plan what we call standardization is seen to be fundamental groundwork in architecture. All things in nature exhibit this tendency to crystallize; to form mathematically and then to conform, as we may easily see. There is the fluid, elastic period of becoming, as in the plan, when possibilities are infinite. New effects may then originate from the idea or principle that conceives. Once form is achieved, however, that possibility is dead so for as it is a positive creative flux". So there you have it. The secret is to conceive the building in the mind, not on paper, until it is complete in the mind. How is this possible? How and from where does the idea come? Mr. Wright said, "You wont find me sitting at a drawing board trying to design something." He called that rubbing the smudge and trying to see something in the mess. If one does not design at the drafting board, then where does the work get done? Mr. Wright said go and do other work. As an apprentice at the Taliesin Fellowship I found it was always good to look busy or else one of the senior apprentices would put you to work. I had never consciously used my mind in this way, until I read it in Mr. Wrights own words. Well I thought, if Frank Lloyd Wright said he worked like this, then it would work for me. I believed that if I could just understand the problem of the needs for a design and experience the site location first hand, that sooner or later the idea for the form would come into my mind. The book "Writings and Buildings" mentioned above was read in May 1960 and served to reinforced my understanding of what I had previously learned from my first mentor, Will Wilsey, Architect and Taliesin Apprentice in 1945-46. I had gained knowledge from reading other books written by Mr. Wright and by being in continuous contact with members of the Taliesin Fellowship. The following design was done in January 1960 and I consider it to be my first original creative design as an apprentice at Taliesin. The description that follows attempts to reveal my thinking progress at that time. The project was a one room shelter in the desert in which I could sleep and spend some private time. There were many such shelters at that time because all the apprentices had individual tents or had built their own shelters. The program was simple: a place to sleep, a fire place, a table to work at and a few places to sit when I had visitors inside and out on a terrace. I went out and found a site on the edge of one of the washes that had a view of the valley and distant mountains. I spent time sitting on the site to get the feel of everything in my mind. I then went and did other things. A few weeks went by. I just kept the thought of the needs and the site in the back of my mind and from time to time revisited the site. One day I was working in the Taliesin West kitchen and the idea came into my mind as I was drying some cake molds. The molds were sort of leaning together and I saw the idea for a roof and a great space under it, but not round like the cake forms. I did not copy the shape of the cake molds but they were sure the inspiration for the idea that was beginning to form in my mind. As Mr. Wright had written, I resisted the temptation to start to sketch this idea and just kept it in my mind and tried to visualize it in more detail. Over a period of time, I would try and focus on the design and visualize it and then forget it and do other things. I found that often, as I was just becoming conscious after sleep, I would have a vision or additional ideas about the design I was working to create. I found that I could visualize and change the design in my mind and try things out and revise the visualization. I did not draw this design until I could see it in my mind, in nearly complete detail just as Mr. Wright said he did it. Then and only then did I go to the drawing board and draft the visualization already there in my mind. EAST ELEVATION, Drawing done after the plan was drawn. The whole design could be seen in my mind as I drew the plan. So the drawings were just to resolve details and refine. Date January 1960 can be seen under my name. I had been at Taliesin five months and I began to understand the use of the Creative Mind. I have used this way ever since that day in 1960. It is a very powerful practice and also very fast. Later I found that it did not matter what I was doing, the solution to the design would just come to my mind. I could go on and continue to refine the conception in my mind as I just reviewed it only in my mind's eye from time to time until I could see it completely. The real beauty of mind conception is that there seems to be no limit to how many projects I can give my mind to work on at any one time. The only limitation is output, as the conscious mind can only think about one thing at a time. Our minds are aware of other things but we can only focus on one thought at a time. I find that ideas come to me when I am working on something completely unrelated. When this happens, I just make a short note to myself so I remember to get back to that place in my mind, and then go on with what I am doing. When I look at the note, it puts my mind right back where it was and I can focus on that idea. The best time for a creative vision is just as I wake from a short nap. As I come into consciousness, often an idea will be there as in the end of a dream. I find that I can go into a short nap with a specific need and the solution to that need will be there in my mind as I awake, not some unrelated idea but a solution to the very need I had. The amazing thing is that I can specifically request a vision for the need I have and the vision for that need is the one my mind receives. As you learn how to receive and allow the solution to develop in your mind, you can solve any problem. This is how the finished Desert Shelter design was refined.